Turns out designing space faring vessels isn't as dificult as I had at first thought. This representation took all of about 45 minutes to create. So that wasn't challenging enough. Havining been at this now for a coople weeks I decided to attack this itch from a more detailed deck level approach. This is the Bridge level of an Akyazi Class Star Ship. The second deck was a little easier but shaping the coming of the bridge dome was challenging. I've learned more tools in Hex in the process. What's missing in hex is a repeat key. 1) In AutoCad, when you key in a line tool, draw the line, when you click the mouse it "validates" the line but what I like about AC is that if you click again, it starts a new line (the same tool you previously used) wt the point of the click. 2) I want to pull a curve from an existing edge that has no points on it. Can't figure out how to do that. What I want to do is grip an edge and pull it out to create a curve. 3) I also want to connect points I inserted on an edge, with a new perpendicular edge. How do you draw a new edge after iyou insert the points? Start a new line, choose the Composite Curve property, start drawing. There you go. A) I used "Insert Points" to add 18 points to the left edge of a rectangle in order to weld to the points of a cylinder with 18 corresponding sections on the end of it. The rectangle is still a rectangle though. No edge lines running through it. Now I want to add another cylinder with 18 sections to the other end of the rectangle and I want "edge" lines to connect the two cylinders at either end. Being that I added another 18 points on the right side of the rectangle, can I somehow draw in "edges" (lines) to connect the two rectangle sides and cylinders? I've used "Bridge" in some circumstances. That will add the new edges corresponding to the cylinder but it won't work here. I don't find that tool in my Hexagon tool pallet. Or you just extrude from the lines. It's not a tool. I told you, start a NEW line (while the old one is still selected) and choose the Composite Curve property. I haven't logged on her in a while. Thought I'd drop in and display the latest in my Akyazi bridge design. Pic #1 is the Hexagon product. Still working on the details but I'm whittling the job down. Once I get the hang of this I'm gonna do more of them in slightly different designs. Looking good. Nice efficient looking work area. And lots of space for people to be thrown out of their chairs whenever the ship is attacked. Seat belts could have prevented so many injuries on ST:TNG. Well. I started this hobby Saturday, ‎August ‎11, ‎2018, ‏‎12:03:08 PM when I down loaded and installed Hexagon and Daz into computer and started learning about 3D modeling from scratch. I'm now 4 months down the road of experience in Hexagon and here's my list of projects. Of them all I have had the most fun with the star ships and plan to continue developing them. I'm also planning to start building residential and commercial structures some time this new year too. I hope you all are having the same success and enjoyment as I am. I have enjoyed seeing your progress, Mike! You're learning very quickly and producing some really great looking models. I've been enjoying this imensly! I have a small list of new projects now and I'm constantly amazed by the rest of you guys work. I'm looking forward to making this a full time income source! Merry Christmas to each and all! Peeps with some real world building experience tend to translate those skills effortlessly to 3D, because to their visual spatial dexterity. Just finished a control console for the delivery device. Took about 8 hours I think. Getting faster at roughing out now but still working on learning mapping and textures with this software. It was suggested that I rig the two control cylinders so I'm considering adding that. The mapping in Hexagon still needs a great deal of work on he part of development and as such is still bitnfrustrating to use. 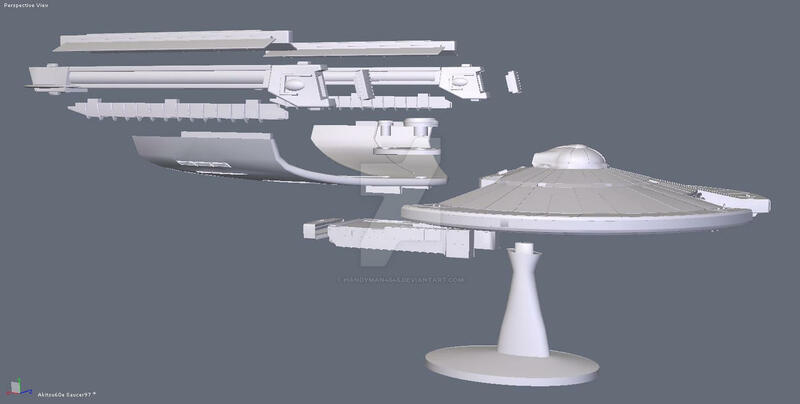 I have the USS Akitsu yet to upload for sale and still need to the finalize the mapping on her hull. Then finish and Christen with a ships designation, the Arbiter I started and finally, start the Akula class ship. I'm working on new ideas on ramping up her engineering and appearance to better fall into the engineering of the cannon versions that come latter in the storyline. 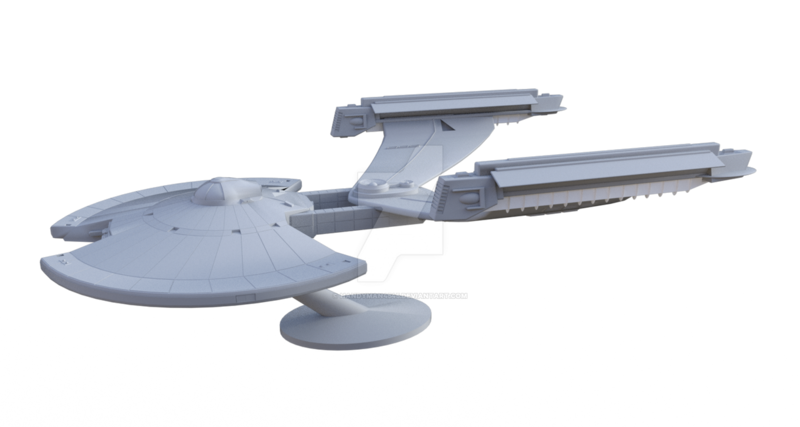 Assuming they sell, I'll develope some additional versions that are in damaged condition and or under construction for s star base rendering. I'm hoping that people will buy the ships and put their own designations and storylines behind them. I'm rather attached to the 1012, Akitsu myself. Maybe I'll develope some "prints only" work. I'm also starting a simple commercial garage rental complex with over sized bays and roll up doors. Just add mechanics or racing or dog food packaging models. Anybody doing ST poses for G8F & G8M ??? I need bridge and engeneering poses. Regarding the control console and the cylinder extrusion. I'm locking up on the "y" axis issue due to the cylinders being set at a 15 deg angle. Currently they retract and expand but the entire cylinder moves up and down the face of the console as it does that. Can't figure out where to find the controls for accomplishing the "rotate the Y axis to the angle of the cylinders" part. Anybody have any experience in this? On the up side, I got the verticle sliders (2) and the T-handle to work but cylinders remain farked up. I made this yesterday while fiddling with one of IG's special effects textures. The texture on the sphere reminds me of the original view screens and "planet" scenes on Star Trek TOS, which I would have watched in black and white. More to come. I can make you one with just the blue planet-like object for your view screen if you like. With luck l am adding two computers (a mini "render farm", bwah-hahaha) to my setup. Currently re-installing my entire DAZ catalog on computer #2 at the same time as I am doing rendering on my main computer. IDEA: I just finished reading Anthony Doerr's All The Light That We Cannot See (Wikipedia English link)... not really related except small scale wooden models of towns, especially the exteriors (but possibly interiors like on your ST "bridge") are a major theme in that book... sooooo, my idea is: include some Easter eggs somewhere like in a utility storage cabinet or a desk drawer here and there, aboard the ship. Example: a furry Tribble or a phaser handgun or a Commodore PET or a picture of Neil Armstrong at the bottom of a crew member's closet, in their quarters. DAZ users cannot find the eggs unless they use morph controls to open the closet drawer or the desk drawer. Not sure how to make specific objects invisible when a model is opened in the Scene pane. I have very little Poser experience. P.S. There are supposedly some Easter eggs on the moon incl. some pin-up pictures and I think some artwork by Andy Warhol. First part of my reboot/re-install went reasonably well... however I was a bit surprised to see "Hexagon 2.5" in the download list, in DIM. I wonder what happens when I select this file using DIM in Windows 7? Standard insertion into the list of programs, and a desktop shortcut is created and so on? I really like that rough texture, almost looks like a sand casting... what is the 3D printing process used? Curious if you are using 3-D printing to "preview" your Hexagon work or other prototypes before going to injection molding, or...??? I have zero knowledge of this, having done just a tiny bit of molten aluminum say, and vacuum-forming styrene. Oh - and some RTV as well. Wonder if they still make that. Anyway one of my greatest frustrations as a kid was when the holes and pins didn't line up, on various styrene models. How did some of those things ever make it past quality control, I'll never know! I don't know if those "Polar Ice" reissues (that are made of resin apparently?) are good but I've been leery of them mainly because of the memory of small-run items that didn't quite fit together properly. 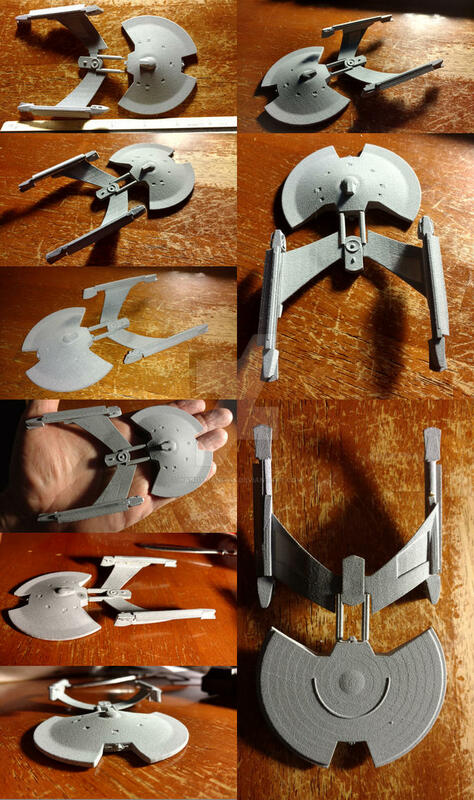 "What is the 3D printing process used?" The process was a commercial outfit here in America using MJF Nylon with no surace polish or tumbling. "That's a job and a half Handyman - Well done :)"
I greatly appreciate the compliment. It took about 10 hours total, I think, to adjust the drawing to a model ready state. Below is the iRay version rendering.